All Tournament Director's decisions are final. No protests are allowed. Maximum of four players on the court at one time during a game. Minimum of one of the players must be female and on the court at all times. Teams can play with three players (injury or other circumstances) but one must be female. Team rosters limited to five players. Players may only play on one team throughout the tournament. The Tournament Director in the event of injuries, etc., may make exceptions. The tournament will consist of round-robin pool play followed by a single elimination tournament. All games will use rally scoring. "Ball On" will only be called if the ball interferes with play, (directly or indirectly), or if the ball becomes a safety hazard. 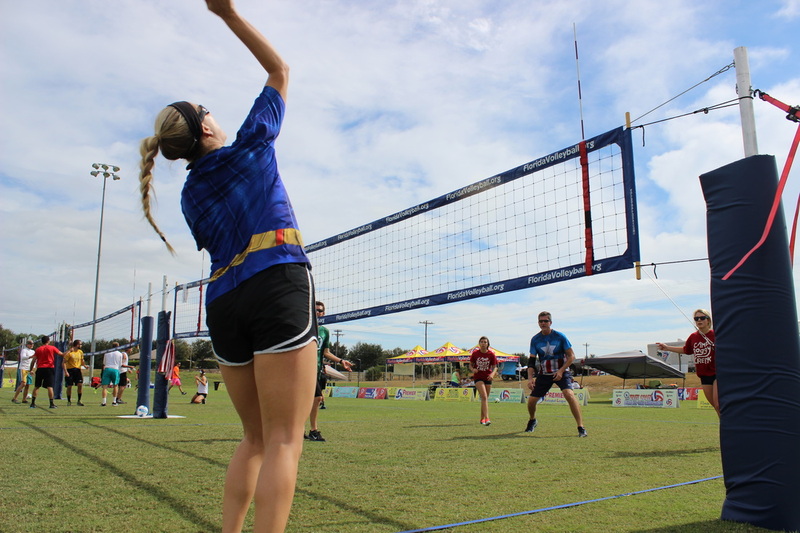 Teams will provide a referee and scorekeeper for each match as assigned by the Tournament Director. The scorekeeper is responsible for getting the score sheet before the match starts. The WINNING TEAM is responsible for bringing the score sheet to the registration tent. Blocking or attacking a serve is not allowed. All substitutions must be made into the serving position. Substitutes will leave the game from the front right position. Substitutes will enter into the back right position just prior to serving. All players do NOT have to substitute OUT, and players may substitute back IN, in any order, provided that Rule #2 is maintained. Players will rotate in a clock-wise direction before each serve, including after the first sideout in a game. Players must keep proper relative position before each serve. Only front row players may attack or block the ball when it is above the height of the net. All net violations will be called. Hair touching the net is not a violation. Clothing touching the net is a violation. All Jewelry (watches, necklaces, bracelets, etc.) should be removed. If the ball hits a pole or its support cables, it is "OUT". "Net Serves" will be allowed. Any method may be used to serve the ball, as long as the ball is obviously hit and not thrown. Serves will be made from the back right area outside the court. Players may not enter another court during, before, or after an attempt to play the ball. Players can play, but not attack, serve or spike the ball from outside the court. The score keeper should call out the score before each serve. The referee will motion for serve. The score keeper should assist the referee in looking for net violations and other faults. Players may not reach across the net to attack a ball. Players may reach across the net to block a ball, provided that attacking team does not have a play on the ball or has used their allowed three team hits. Each team is allowed two 30 second timeouts per a game. Maximum of three team hits per side. A female does NOT have to touch the ball. A block does NOT count as a hit. The ball may be played by any part of the body, as long as it is not held or thrown. Obvious carries or lifts should be called. Double hits are allowed on any first ball over the net. Incidental contact under the net is not a fault. 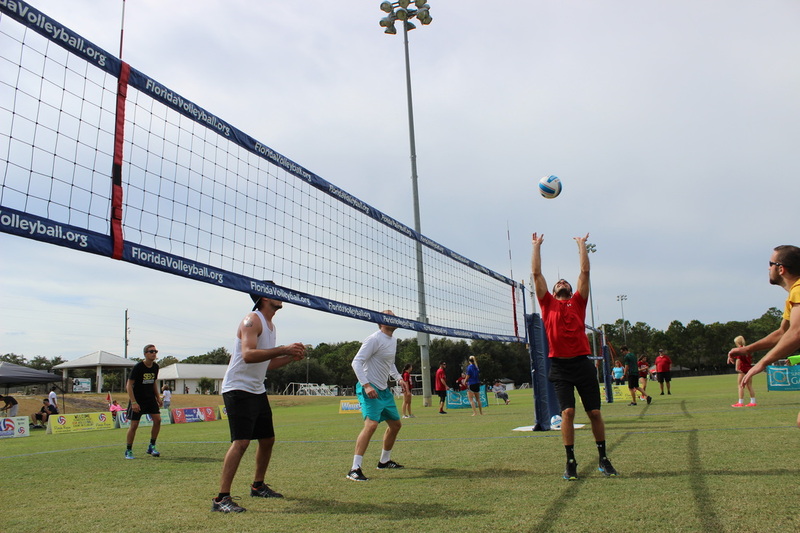 Players may cross under the net as long as they do not interfere with players on the opposing team. The opposing player does not have to be making a play on the ball for there to be interference. Standard outdoor rules will be used for overhand contacts (Reviewed and discussed at captains meeting). Serving order (1-4) will be established by each team-players can play and stay in the same position during the set. One female must be on the court at all times.